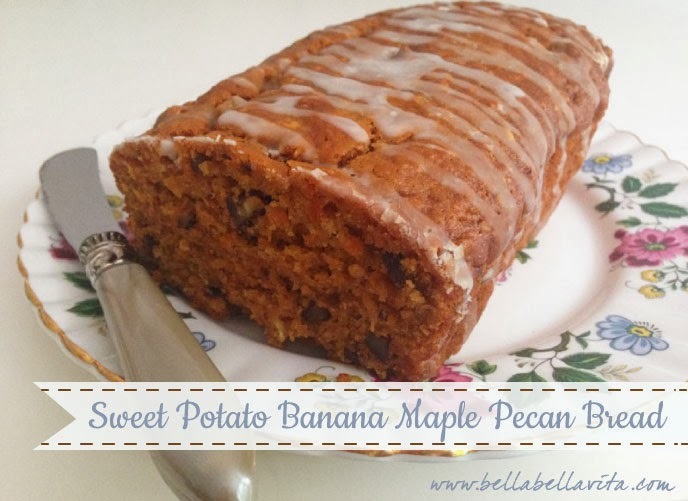 I'm in the kitchen again playing with my sweet bread recipes and created this Sweet Potato Banana Maple Pecan Bread. I love to challenge myself to develop new recipes based on what I have in my pantry and I usually have an overly ripe banana and sweet potatoes. I used a touch of maple syrup to add a fall flavor (think sweet potato casserole or banana pancakes). I was very pleased with how this turned out ... super moist and oh so good. I will definitely be giving this as holiday gifts this year! To roast sweet potatoes, peel and chop them into 1/2 cubes. Line baking sheet with foil and arrange sweet potatoes in a single layer and coat with olive oil spray. Roast at 425° for 35 minutes until tender and browned. Cool completely and then purée in Cuisinart. Consistency will be thick. Line another baking sheet with aluminum foil and spread pecans in a single layer. Drizzle with maple syrup and toast in oven for 5 minutes. Set aside to cool. Using a Kitchenaid mixer or hand mixer, combine sugar, sweet potato purée, mashed banana, eggs, oil, buttermilk, and maple syrup; mix well. Drizzle icing on top when cool. I use my toaster oven to roast the sweet potatoes and toast the pecans. I find it much easier to use than my oven. I roast all kinds of things in my toaster oven! Don't miss my other sweet bread recipes .... they are all low-fat and yummy. I bet you won't be able to eat just one slice!